노랑부리백로는 산란기에 부리가 노랗게 변한다 하여 붙여진 이름이다. 이 시기에는 머리 뒤에 여러 가닥의 장식깃도 발달하게 되지만, 산란기가 끝나면 다시 부리가 검게 변하고 장식깃도 사라진다. 백로와 외양이 비슷하지만, 걷거나 서있을 때 상대적으로 몸을 곧게 세우고, 앞쪽으로 다리를 높게 올리는 움직임이 특징적이다. 또한 백로의 배설물은 생태계에 피해를 주는 반면, 이 새는 서식지와 멀리 떨어진 곳에 배설하기 때문에 큰 피해를 주지 않는다. 여기에 더해, 같은 먹이를 두고 경쟁하는 괭이 갈매기와 평화롭게 같이 살 정도로 친화력까지 있어 ‘귀족새’라는 별명이 붙었다. 주로 만, 간석지, 갯벌에 집단으로 서식하지만 최근에는 환경오염으로 인해 무인도로 서식지를 옮겼다. 그러나 전 세계에 서식하는 개체수 중 3분의 1인 천여마리 정도가 매년 안산시를 방문하기 때문에 경기도 안산시의 상징새로 지정되었다. The Chinese Egret is the symbol of the city of Ansan. They are known to come to Korea for the summer time but migrate elsewhere when winter comes. There are incredibly few left in the world, numbering only 3,000. One of the reasons that Ansan is proud of this bird and has chosen it as a symbol is because 1/3rd of all extant species come to Ansan in the summer. Chinese Egrets are quite unique in the fact that their bills will change color. Usually they are yellow during the mating season, and as it goes further past that they become a darker color again, often even black. 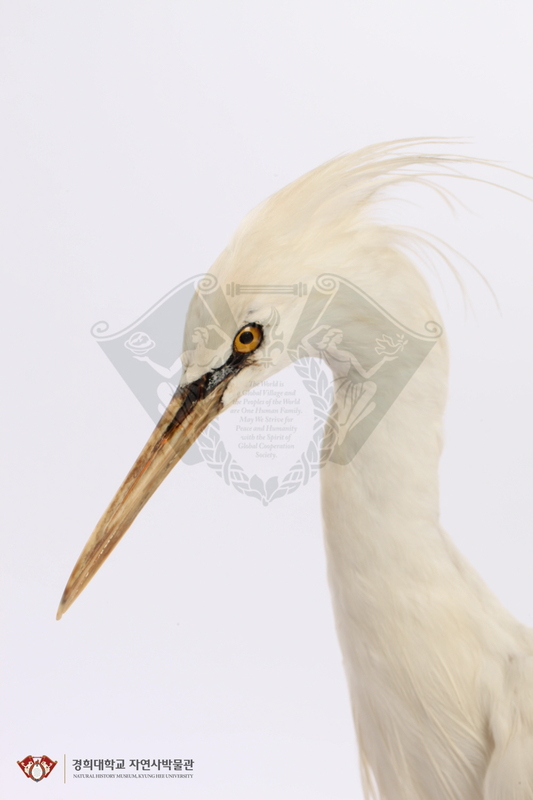 Chinese egrets have yellow beaks and white bodies. They tend to live near coastline, mudflats and tidelands. They eat fish and crustaceans. Their entire bodies are white but they do have some decorative plumage on their chests and rather striking yellow beaks. Their eyes are blue in color, and their legs are black with yellow feet. CopyrightⓐKyung Hee University Natural History Museum 2015 All Rights Reserved.